Wow, it has been almost three months since i have done a normal WIP post, and since I am still here, still huge and currently 37.5 weeks pregnant (full term, yippee!) I thought I would do a WIP roundup of sorts. Kind of a reminder to myself of all my current projects floating around my house that I will complete this year! And yes, I said it, I will complete these this year, or else! Just kidding, but seriously it is my New Years Resolution! Row 1 - My current project, I have 2 of 4 panels quilted, using the Quilt As You Go method. This was a Lily's Quilts Quilt Along. Goal is to have it finished by March. Row 2 - Bottled Rainbows Quilt Along 5 of 16 blocks completed. Row 3 (From Left to Right) - Kaleidoscope Quilt Along awaiting basting, Fox Trails baby quilt awaiting cutting, Baby boy quilt for my nephew top halfway pieced, Denyse Schmidt Log Cabin Blocks from the Quilting newBEES group top awaiting piecing. Row 4 (From Left to Right) - Christmas String Blocks from the Christmas Fabric Bee group top awaiting piecing, Heather Bailey String Blocks from the Always Bee Learning group top awaiting piecing, Postage Stamp Blocks from Scrapbuster Swap not sure what I will do with these, Scrappy Depression Blocks from Scrapbuster Swap top awaiting piecing. Row 5 - Wonky Christmas Stars from Scrapbuster Swap, possibly table runners and pillows. Row 6 (or Last Photo) - Good Fortune Fabric Bundle to be possibly used in the Swoon-Along hosted by I'm A Ginger Monkey. Currently hoping I can figure out how to make this Fat Eighth bundle work with the Swoon blocks! New Projects - What is new, what is old? Who knows? I lost track a long time ago! 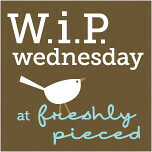 _Head over to Freshly Pieced to have a look at what everyone else is working on! Wow - what alot of good stuff going on here! It's good to list them out, isn't it? Love all your bee and QAL blocks!! And remind me what pattern you'll use for Fox Trails?? Gosh, that is a lot of projects, Marci! But they all look so great. I really like your Bottled Rainbows blocks. I used that Riley Blake cars fabric for several things for Max's nursery. So cute for a little boy. Congratulations on reaching full-term, too! Not much longer!! Ooh, that fabric is going to make a lovely Swoon! I'm always in awe of pregnancies that make it to term -- as I delivered early, at 34wks -- so good work! I think the fat eight bundle will make a wonderful swoon! I'm mixing up fabrics for mine -- as I don't have enough to make each block from just 2 colors, and it's going fine! With all the fabrics cut up in advance, it takes me about an hour to make a block! You know I love all your projects and I hope you do get them done. Lovely to hear that baby has stayed put so long, that's wonderful.